The 3400 comes standard with the Tidel Cash Dispensing Mechanism (TCDM) which offers field expandability from 1 to 4 cassettes at a significantly reduced cost. This dispenser is based on market proven dispenser technologies and can easily be upgraded in the field to offer up to 4 high capacity cassettes. With the addition of services such as CashWorks check cashing, PaySpot™ prepaid wireless and Western Union® Money Transfer®, the need has never been greater to have the scalability to upgrade your cash dispenser capacity. Tidel’s industry-leading 18-month parts warranty speaks volumes about the rugged reliability of its 3000 Series ATMs. 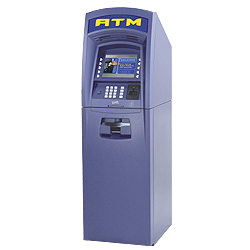 Additional features such as constant monitoring and logging of vault access, Encrypted PIN Pads (EPP) and Triple DES compliance make the 3400 a leader in ATM security. The 3400 also complies with all existing and currently proposed Americans with Disabilities Act (ADA) regulations, and includes standard hardware for private audio transactions. Extend your ATM Investment into the future with the ability to upgrade your 3400 to Tidel’s 3600 CE-based ATM platform, as demand for processor intensive applications grows.